Tex Barry's was stop number 19 on the National Hot Dog Month Tour. 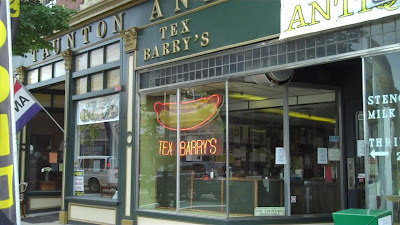 I know we went to Tex Barry's on Monday, this is the Tex Barry's in Taunton, MA. Tex Barry's was once a 14 unit franchise in this part of the state; now there are only two left. Tony, the owner, bought this business in 1984 after the Tex Barry franchise group broke up; he's been running it ever since. The Coney Island sauce tasted just like the sauce at Tex Barry's in Attleborough, Tony doesn't add celery salt though, that's a self service thing at this location. We were there early, so it was kind of quiet. Things were just picking up as we had to hit the road. Drew Bennett got a bunch of pictures which are posted on the Hot Dog Stories Facebook Page. Get the whole story on our visit to Tex Barry's Coney Island in Taunton on Hot Dog Stories.